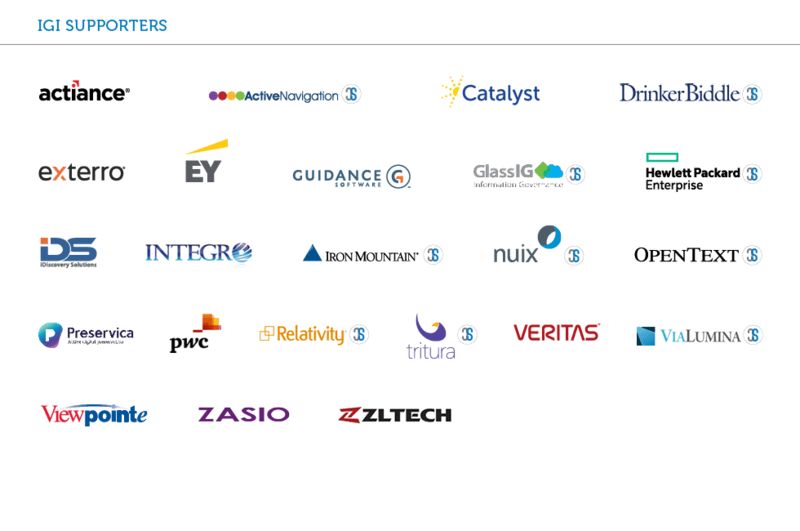 The Information Governance Initiative is supported by these leading providers of Information Governance products and services. Visit Our Partners to learn more about the organizations and associations the IGI collaborates with to bring IG stakeholders from different disciplines together. Interested in learning more about becoming a Supporter? Contact us for details. Actiance provides compliance across the broadest set of communications channels with insights on what’s being captured. Actiance customers manage over 500 million daily conversations across 70 channels and growing. Customers include the top 10 U.S., top 8 European, top 5 Canadian, and top 3 Asian banks. The Actiance advantage is customers stay ahead of compliance and uncover patterns and relationships hidden within their data. Catalyst designs, hosts and services the world’s fastest and most powerful document repositories for large-scale discovery and regulatory compliance. For more than 15 years, corporations and their counsel have relied on Catalyst to help reduce litigation costs and take control of complex legal matters. Exterro was founded with the simple vision that applying the concepts of process optimization and data science to the way companies respond to litigation would drive more successful outcomes at a lower cost. To this day, we remain committed to this vision as we deliver E-Discovery and Information Governance software solutions that help organizations manage their information assets more efficiently. EY Information Governance services assist clients in understanding and ring fencing complex legal, regulatory and litigation-driven information risks. We employ sophisticated analytics and linguistic tools to interpret large data stores, from unstructured regulatory archives to Big Data warehouses, identifying and helping clients act on potentially relevant information. GlassIG is an independent software vendor. Their aim is to provide market leading and cost effective Information Governance for everyone. This is why their solution is easy to use and scalable from small and medium businesses, right up to huge multinational corporations, from cloud to on-premise environments. A few years ago, as a division of RSD, a team helped to define the field of Information Governance and in response developed GlassIG, their industry leading solution, which they are constantly innovating and improving. At GlassIG their enthusiastic team has a wealth of expertise and experience which professionals can benefit from. Their leading edge software and services solution is second to none. Guidance Software exists to turn chaos and the unknown into order and the known—so that companies and their customers can go about their daily lives as usual without worry or disruption, knowing their most valuable information is safe and secure. Makers of EnCase®, the gold standard in digital investigations and endpoint data security, Guidance provides field-tested and court-proven applications that have been deployed on an estimated 25 million endpoints and work in concert with several other leading enterprise technologies. iDiscovery Solutions (iDS), an award-winning, legal technology expert services ﬁrm with offices in DC, and Seattle, has been influencing the intersection of law and technology since it’s inception in 2008. iDS provides consulting, solutions, analytics and expert services in the areas of electronic discovery, digital forensics, information governance and enterprise applications. Integro is an award winning, industry recognized products and services firm specializing in Information Governance, Enterprise Content Management, and Content Security solutions. Since 1995, Integro has been delighting clients with technology solutions that support defensible disposal, minimize risk, reduce eDiscovery and storage costs, ensure compliance, and govern email records. Integro is proud to be named a Top ECM Consultant by research firm, Clutch, a “Cool Vendor” by analyst firm, Gartner, and a Worldwide Governance award-winner by IBM. Iron Mountain is a storage and information management company, assisting more than 156,000 organizations in 36 countries on five continents with storing, protecting, and managing their information. Organizations in every major industry and of all sizes—including more than 94 percent of the Fortune 1000—rely on Iron Mountain to store and manage their information. Preservica’s award-winning digital preservation software is used by leading organizations and institutions around the world to ensure their vital long-term and permanent digital records remain findable, useable and trustworthy for decades into the future. Our customers include the Associated Press, Texas State Archives, HSBC, British Telecommunications and the UK National Archives, to name a few. Viewpointe®, a leading cloud provider of information governance and payments exchange services, is recognized for its national, trusted archive of digital information containing over 33 petabytes and growing. With expertise in serving highly regulated industries, Viewpointe offers the scale, security and best-in-class infrastructure needed to meet the most complex content management and information governance requirements. Viewpointe’s information governance platform, OnPointe®, leverages your existing technology investments and streamlines your information governance processes, management, access and storage via a private cloud, helping you mitigate risk, increase efficiencies and reduce costs. ZL Technologies, Inc. makes Unified Archive® software (“ZL UA”) to enable large enterprises to manage all unstructured content such as e-mail and files, to satisfy corporate analytics and archiving needs for e-Discovery, records management, regulatory compliance, corporate governance, storage management. It also enables the same unstructured content to become the organization’s Corporate eMemory® for competitive advantage, such as sharing knowledge, experts, and history across the enterprise. ZL UA’s unique differentiator is its unified architecture, which consolidates all applications and billions of documents under one platform, thus eliminating today’s fractured data silos which significantly raise operating costs and legal risks. Demonstrating a proven track record with Global 500 customers and strategic partnerships with major players such as Oracle, PriceWaterhouseCoopers, and SunGard, ZL has emerged as the technology leader in harnessing unstructured “Big Data” for strategic advantage. Drinker Biddle recognizes that information governance is an integral part of corporate governance and risk management. We understand that skillfully governing a business includes skillfully governing its information, leveraging that information for best use, and avoiding the risks excess information can create. What distinguishes information governance from mere information management is that it determines why a business creates and utilizes information, not simply how. When a business knows why it creates and uses information, it can leverage that information for its best use and minimize the risks inherent with the over-retention of data. We live in an era of Internet-scale enterprise infrastructure, powerful analytical tools, and massive data sets from which we can potentially wring profound new insights about business, society, and ourselves. This is an era of unprecedented scrutiny from courts and regulators, an era where the difference between the winners and losers is mastery of information. ViaLumina is a specialized professional services practice offering information governance consulting services. We help our clients maximize the value of information and comply with legal requirements for its management. ViaLumina accomplishes this by providing a range of Records and Information Management (RIM), compliance, assessment, implementation, training, and other professional services. ViaLumina consultants have helped the world’s leading institutions achieve clarity about their information environment, and thereby minimize the risks—and maximize the benefits—of information.